Mountain Views from the patio, from the pool, even from your bed! This dynamite home has all the good stuff!! Single level, corner lot, no home behind or on the side, glorious mountain views from everywhere front and back, across from the park and mountain hiking trail. Inside is a great floor plan with a formal living and dining space or game room, kitchen has granite, breakfast bar, gas stove, and eat in dining area with bay pop out looking into the back yard. Large family room is open to the kitchen. This is a split floor plan with the master in the back of the house. 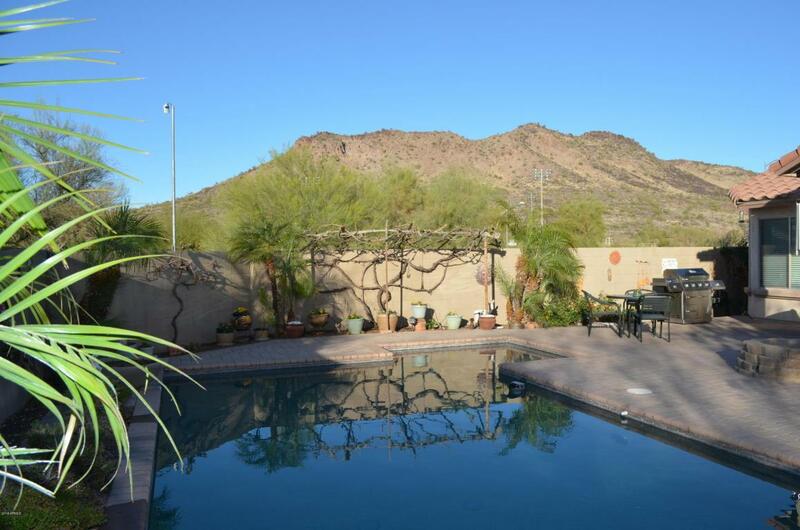 The back yard is an oasis in the desert with paver's, plants, flowers, grapevines, and more! Relax all year long in the hot tub or pool while gazing at mountains by day and the stars by night!